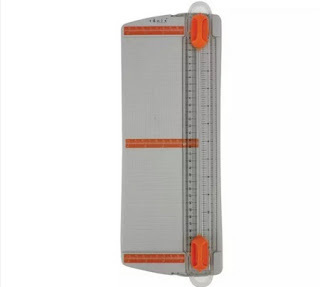 Buying the Best Paper Cutter ! Hi friends, I am often asked for guidance on what products and tools to buy and I also love to keenly follow papercrafting tool discussions on social media and forums. One discussion which keeps cropping up time and again is which is the best paper cutter to buy! Way back in 2012 I shared a post on Paper Cutting Tools and though a lot of what I wrote then is still valid , 5 yrs down the lane I think it's time to revive the discussion on paper cutters. Should you really buy a Paper cutter ? The answer is a big YES!!! 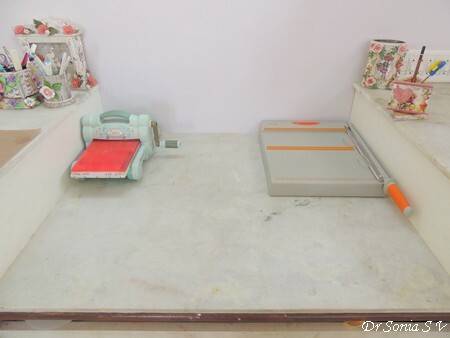 Regardless of whether you are a card maker, scrapbooker , hobby crafter , professional crafter or just a homemaker...you should definitely get a paper-cutter!! We all love using scissors but using a scissors to cut perfectly straight lines does take a bit of effort and time doesn't it!! Having a decent cutter makes cutting paper not only super easy but quick , accurate, enjoyable and efficient!! 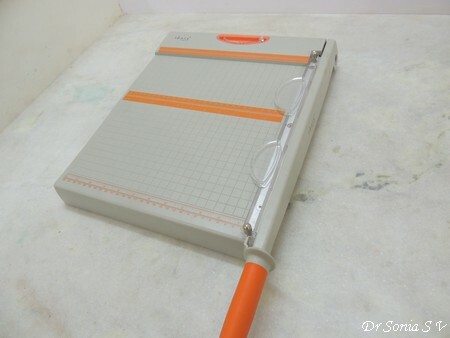 Which is the best paper cutter ? Most of us like to research well before buying a new tool or product but there are such a huge variety of paper cutters out there that it can get pretty confusing. And the "Best Paper Cutter" for you will actually depend on your needs, personal preferences and budget! That said, paper cutters range from exorbitantly expensive industrial standard ones which can cut a massive 400 papers in one go to cheap plastic ones which you are better off not buying ! but since I want you to make your own decision not only now but also in the future when newer and newer cutters come into the market, I am discussing the important factors you should consider before buying the perfect cutter for you!! so that I can bring to you a useful and completely unbiased post. 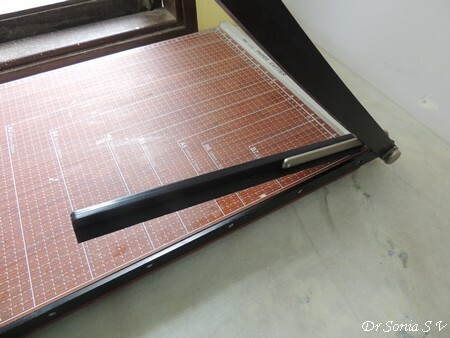 Here are the factors you should consider to decide which paper cutter to buy. Unless you are really really sure of it I would advise you to get a 12 x 12 inch paper cutter. This is the most useful size for us papercrafters as a lot of our pretty pattern paper comes in that size and most project measurements and tutorials work around that size range! The first cutter I got [an impulse buy from my local market! ]had a base platform which was only 5.5 inches wide. 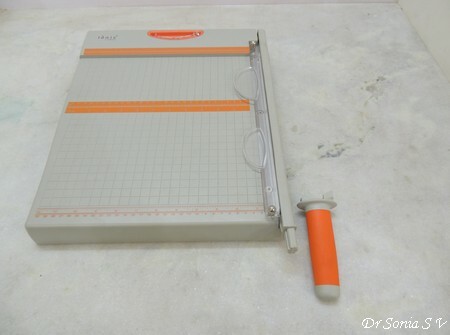 Not only was this cutter a complete misfit for me for lots of reasons, the size per se put severe restrictions on my crafting requirements as I needed larger sizes of paper to make fancy fold cards, boxes and pretty much most projects! But I have seen many many crafters especially cardmakers perfectly happy with a small cutter . So it all depends on your needs. If you have the space and need for a larger size by all means get one.Believe me you will love it! 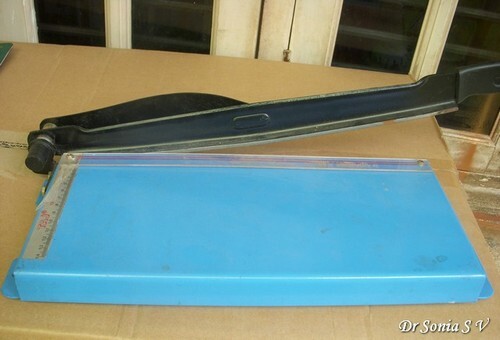 From my small 5 inch cutter I jumped to purchase a huge 21 x 16 inch Deli guillotine . 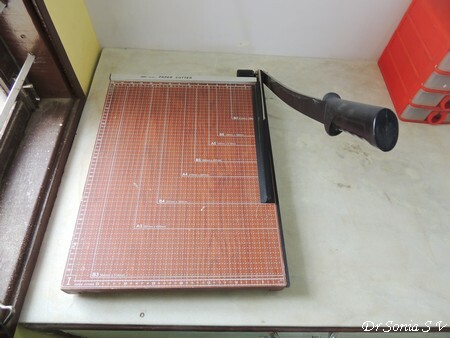 The huge size of this cutter helped me tremendously in cutting and recycling large cardboard boxes, cutting chart paper for school projects and in cutting large ivory sheets which I use in card making and most 3 D projects. Because I have this huge cutter I can buy larger sheets of paper/cardstock [which are always more economical ] and easily cut them down to whatever size I wanted ! But yes it takes up a lot of space and you need to have a dedicated place to keep it. Sometimes the cutter may be able to cut papers 12 inches or more but only by using an extendable arm . And some manufacturers incorporate a fold in the middle of a 12 x 12 inch cutter so that it can fold away for storage or portability. eg : Procision Rotary Trimmer folds in half .Tonic V blade trimmer and Fiskars Sure Cut Deluxe have extendable arms. For many crafters these features may be a bonus feature as they like the compactness and portability features it gives the cutter. But the problem with these type of features is that either the measurements are missing in the junction of the extendable arm/ fold area or it is difficult to get accurate measurements in these areas. This is a crucial point you should consider since the fold / extendable arm junction often falls around the 6 inch mark and that mark is so important to most cardmakers and album makers. So the consensus is that if you need a 12 x 12 inch cutter go for a cutter which has a solid 12 x 12 base without folds or extendable arms. Guillotine cutters which have long blades on levers which you bring down on your paper to get a nice cut guillotine fashion! Precise placement of the cutting line possible and many have markings on the right side of the cutting blade as well as on the casing of the blade through which the blade slides. most brands unless specifically mentioned as self sharpening will need to have the blades replaced- this can be rather tiresome as not only do you have to find a local source for the blades but take into consideration the cost of all those blades you will be needing! cutting specialty paper such as handmade paper trickier and more likely to give frayed edges or even refuse to cut at all! Nearly all the guillotine cutters I researched had fantastic reviews about their cutting ability. you have to exercise due care when working it ! Guillotine cutters have their blades on the long handle and on the base and after cutting it is always desirable to have a cutter which can stay in the closed position without having to fiddle with difficult to manoeuvre locking mechanisms. A locking mechanism which is too hard to lock and unlock makes it a pain so do read specific reviews about the locking mechanism if that is important to you. As of the date of writing this post I have read a lot of negative reviews about the locking mechanism of the Martha Stewart guillotine cutter with crafters complaining how difficult it was to use. The locking mechanism of my large 21 x 16 inch Deli malfunctioned and the cutter stays in the open position with blades exposed ! And yes it is a rather undesirable and admittedly dangerous situation !!! The Tonic 12 x 12 maxi cutter on the other hand has a perfect lever mechanism...there is no lock to fiddle with and the blades stay closed easily. Safety finger guard- can be either a transparent plastic or rubber piece which not only holds the paper in place but also prevents you from chopping off your fingers! 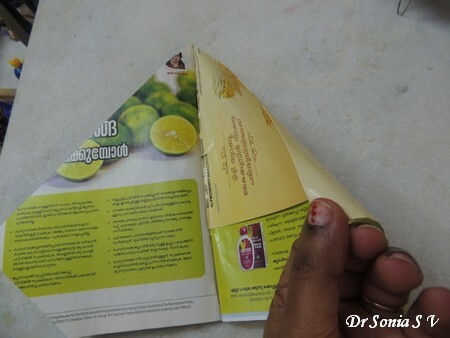 Do read the reviews of the finger guard/paper holder as in some cutters the space under the safety guard was too narrow and crafters found it difficult to insert paper under it easily. Also some guillotines do not have a safety finger guard ! My 10 inch Deli does not have a safety guard and yes I agree it is unsafe and accidents can happen but the advantage is that you can better see exactly where you are cutting!! 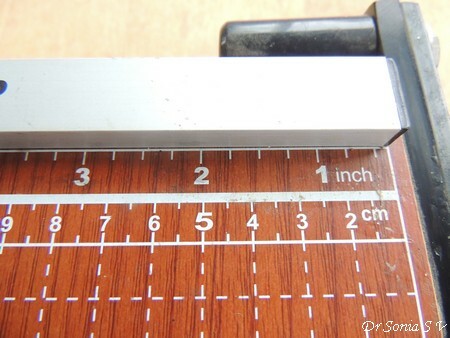 One of the main disadvantages of my Deli cutter [pictured below] was that I had to eyeball measurements smaller than 1/4th of an inch and the grid line on the base was in centimeters which was quite useless to me as I usually worked in inches. 5.Grids on the body - this is one feature which is super useful. 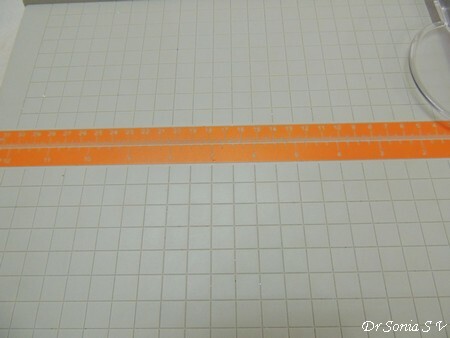 Not only does it help you to see your paper is nicely lined up but it also helps you to quickly know the measurements. Here again it's helpful to have grids in fractions of inches rather than centimeters. 6.Material the cutter base is made of. Metal Cutters are heavy and bulky and many top class brands such as Dahle have cutters made of metal and they cut soooo beautifully ! But do beware of certain metallic local cutters .My first cutter from a local brand [picture above] was metallic and though its blades are still sharp, it creaks like crazy while cutting and the cutting action also is not at all smooth. Plus it has too many faults which I wont bore you with!! Plastic Cutters : Here again stay away from really cheap plastic cutters...not only will they break easily but they will wobble like crazy when you cut! Wooden Cutters: Both my Deli cutters are made of wood and I love the nice sturdy feel of these cutters! Yes having a wooden base will make your cutter heavy and it will all come down to personal preference! Newer features are always being added as the paper crafting industry evolves and tries to woo us with newer, tempting add ons. But beware some features may look good in writing but may not be practically all that cool! eg a Scorer with trimmer may sound awesome but just go through some of the you tube demos and the reviews and you will reach the conclusion that you may be better off buying a dedicated paper cutter and a dedicated scoreboard separately!! 8. Online reviews- be sure to specifically google for the negative/problem reviews! And try to watch videos to see the cutter in action before you take the plunge to buy it. If possible do talk to crafty friends, ask questions online and finally weigh the pros and cons and judge the value for money before you buy. First of all the best thing about this cutter is its size...its base can hold and cut papers 12. 5 inches in size . And this 12.5 inch rather than a simple 12 inch is especially advantageous as many of our pattern papers have an extra 0.5 inch plain bit which we need to discard! It has a body made of good quality plastic which helps to keep it fairly lightweight despite its size . The cutting blades are self sharpening as there are twin blades present on the base as well as on the guillotine lever and each time you bring down the lever the blades slide against each other and not only cut the paper and but also self sharpens! Can easily cut tiny slivers of paper with precisions up to 1/16inch widths! Crafters who enjoy quilling and quillography can easily cut customized paper-strips using thick paper! Measurements are etched so they will not wear off with time. Base has grids etched on it every ½ inches and you can actually even score on these if you want to. 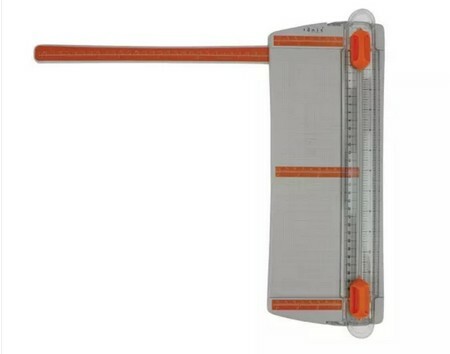 No extendable arm or folding line to hinder measuring in any area!! Transparent plastic finger guard is present near the cutting edge .This helps you to hold your paper near the blade safely. You can even consider the safety finger guard to function as a smudge guard as it helps you to hold the paper in place without directly touching its surface! There is a magnetic well in the top to hold your pins and paperclips! A nice additional feature indeed!! The kushgrip handle is detachable and it can be stored in a slot under the cutter. This makes the cutter more compact for storage or if you want to travel with it. A vertical measurement line would be a nice additional feature to measure the vertical dimensions of the paper without having to turn it. The orange measurement markings on the top were somewhat difficult for me to read without my spectacles...but then my eyesight is not what it used to be...cant blame the cutter for that!! Always work on a stable surface - don't use your cutter on your bed or on a wobbly table - not only is it risky but you will not be able to get the required force! You will get the best cutting results if you use the guillotine cutter whilst standing as then you will use the guillotine levers in the best possible way! The tonic guillotine cuts a wide range of materials. I tried it with thin paper, holographic paper, thick card stock, foam, fabric paper, cardboard, and even plastic and all cut beautifully ! Here is the video demonstration of the Tonic Guillotine in action showing the range of materials it can cut and special demonstration of the dos and don'ts of using a guillotine! I hope you liked this rather exhaustive writeup. Do share tips of your own and views! 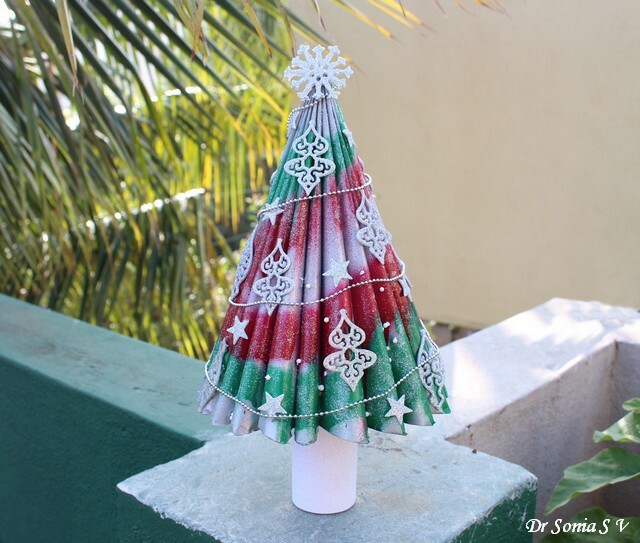 Hi friends sharing a recycling craft - a desktop Paper Christmas tree made by recycling a magazine! 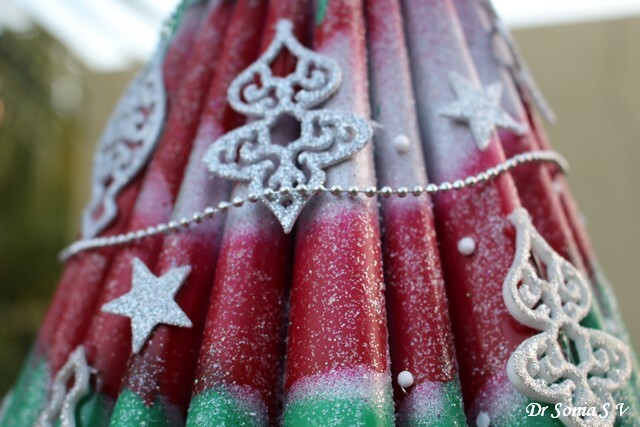 Nothing gives me a kick more than a recycling craft! 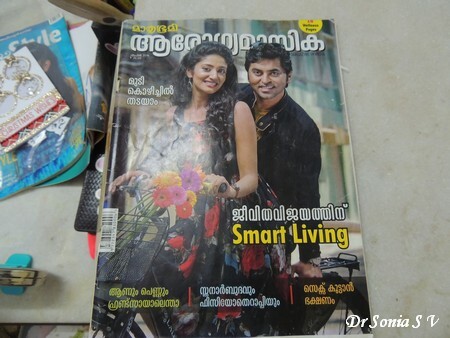 Here is the humble magazine I recycled. 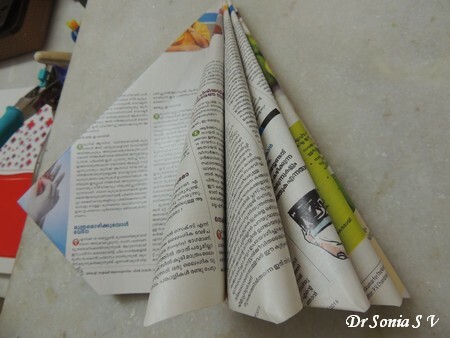 There are so many tutorials on magazine folding and I tweaked a tutorial by Innova crafts to make this Paper Tree. This one is pretty straightforward and very easy to get it right at your first go! 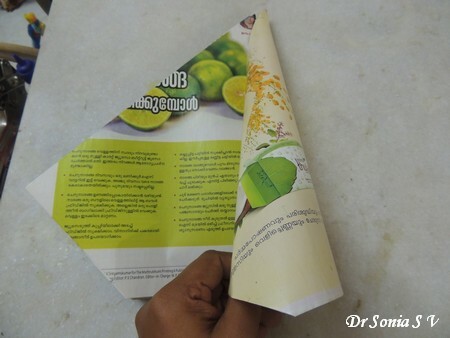 Take 2 pages of your magazine and fold the top and bottom corners as shown above.Keep folding every 2 pages of your magazine until you have folded all the pages. 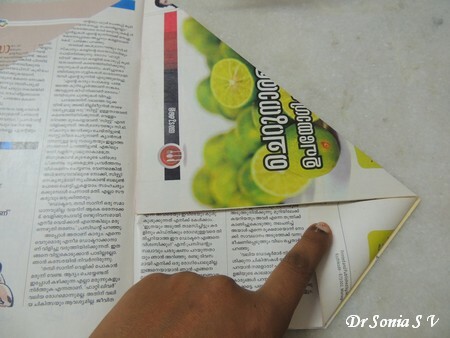 Once you have folded all the pages of your magazine, take out your glue gun and apply a generous line of glue along the central part of your magazine. Take a folded page and roll it inwards and stick it . In this step take care you follow a roll and stick motion and not a folding motion.Do the same for all your pages and your tree will take shape! 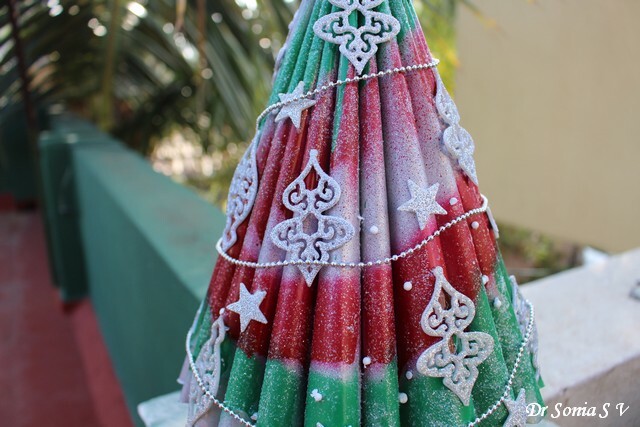 In case you want to paint your tree, the easiest way is to use spray paints. 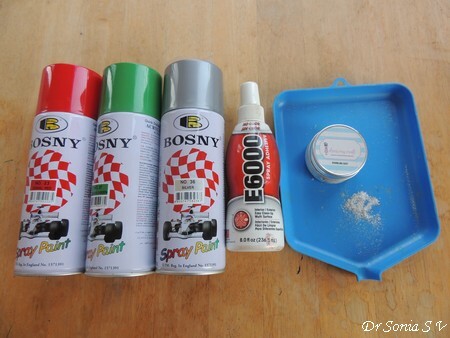 I prefer Bosny acrylic paints as they dry so much quicker and give more vibrant colors compared to cheaper brands but the disadvantage is that these are not exactly kid safe and are best used outdoors. This particular tree was spray painted by my hubby!! 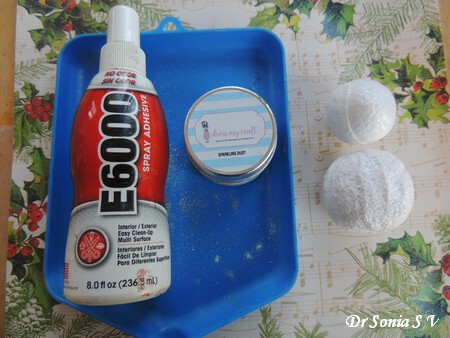 After the spray paint had dried, I gave it a nice spray with E6000 spray adhesive and sprinkled a little bit of lovely "sparkling dust" which was also used in the Sparkling Snowman project. Love the gentle shimmer the glitter gave our tree! Added a few swirls of silver balls and glittery Spellbinders ornaments and silver floam stars and the transformation of the humble magazine to a gorgeous tree was complete!! What do you say my friends ? Hi friends ,it feels so good to be back to blogland after a gap of a month. We had gone on a family vacation to Singapore and I am settling down to normal life only now! 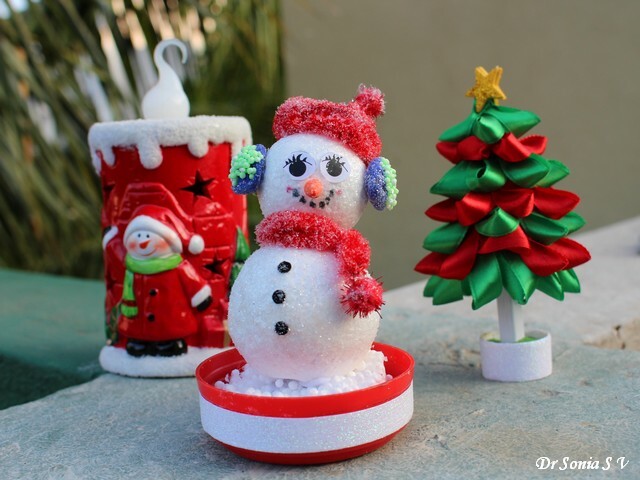 While it's still winter I would like to share a cute snowman my daughter created using thermocol/styrofoam balls and "sparkling dust" a new product launched in India by Crafters Corner. My kiddo is quite good working with clay and she fashioned a nose and sculpted ear muffs for her snowman using air-drying clay . The hat and muffler were made using pipe stem cleaners. 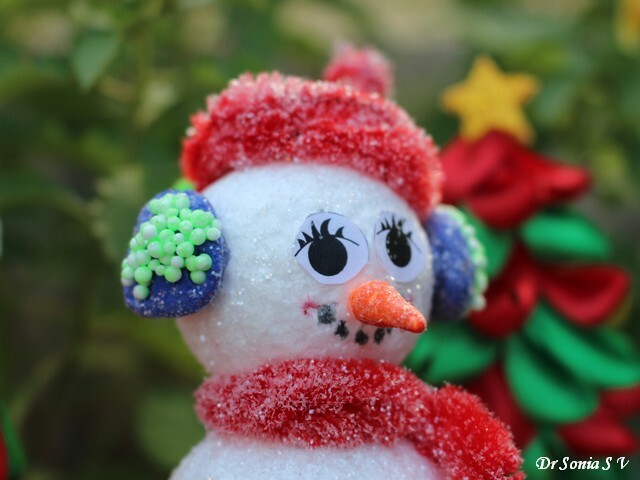 It was so easy to make the snowman sparkle by giving a nice spray using the spray adhesive and dusting over with the "sparkling dust". I have missed my blogger pals and will be visiting everyone soon! !